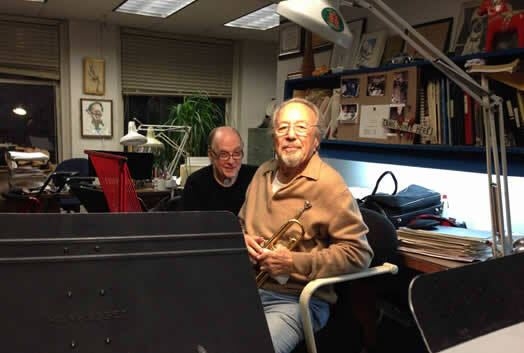 BRIGHT LIGHTS: Emile Charlap (center) with the late Lew Soloff. Emile Charlap, 96, a member of Local 802 since 1940, died on March 22. He was a contractor for 50 years and was also a trumpeter, copyist and arranger. Mr. Charlap had been Dizzy Gillespie’s copyist and close friend. He copied for many Broadway shows including “Sweet Charity” and “Do I Hear a Waltz,” and contracted hundreds of radio and television commercials, recordings and films. Mr. Charlap turned to music contracting in the mid-1960s when the film industry had little presence in New York. He was partly responsible for a parade of movies scored in Manhattan, including “The Wiz,” “On Golden Pond,” “Reds,” “Ghostbusters,” “Dressed to Kill” and “The Cotton Club.” He contracted musicians on albums by Wynton Marsalis, Tony Bennett, Carly Simon and many more. He also contracted jingles, including the ad spots for the 1992 Olympic games. Mr. Charlap is survived by his wife Diane as well as many nieces and nephews. Emile Charlap stopped by Local 802 a couple of years ago to chat with Bob Pawlo about his life. We never got a chance to publish that interview, but we are honored to present it now as a tribute. 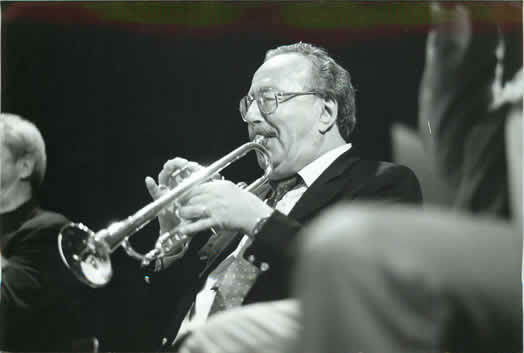 Emile Charlap performing at his 80th birthday party in 1998. I first started trumpet when I was 15. I saw a trumpet in a local pawn shop and I bought it for $11. I started playing bugle calls for the Boy Scouts and became an instant success! In my high school band, I was the only guy that could read music. I chose to play the euphonium parts because they had more melodies than second trumpet. Later I went on the road. My band went on a tour with the USO. When I came back, I started playing in a local band. We were rehearsing at Nola Studios and someone came up to us and said, “Can anyone here copy music?” I said, “I can!” and took out a ballpoint pen. The guy told me, “You can’t copy with a pen!” But I copied eight arrangements for $80. From there, I got more work and eventually became the copyist for Sid Caesar’s “Your Show of Shows,” thanks to my good friend Johnny Mandel. When I started working there, I was sloppy but trying to work fast. The guys said, “Hey fellas, we got a speed demon here!” and everyone laughed. I didn’t know that we were getting paid by the hour. My fellow copyists were writing an eight-measure rest in the same time that I copied two pages of music. I ended up working for “Your Show of Shows” for ten years and then worked for “Name That Tune” after I bought Brick Fleagle a drink at Charlie’s Tavern. Pete Rugolo, who was Stan Kenton’s arranger, also took me under his wing. Pete and I were walking in front of Nola Studios one day and I met Ralph Burns, who did a lot of work for Woody Herman. Ralph told me, “There’s a guy upstairs who’s having a lot of trouble with Woody’s band. Can you contract for me?” I said I would try. I asked a contractor friend of mine for help. He told me everything about contracting. So I did it: I hired the best people, mostly people I knew from Charlie’s Tavern. I had to hire French horns for this session and didn’t know any. So I hired four from the New York Philharmonic. Ralph asked me, “Where did you get these horn players? Are they from Charlie’s Tavern? They don’t swing!” I had the four best French hornists in the world, but French hornists didn’t swing at that time! My contracting career took off from there. By the 1960s, I had contracted over 200 films. I contracted jingles and TV also. I even contracted for Wynton Marsalis. I remember one of my jobs once called for an organ grinder. I didn’t even realize there was such an instrument. I had to go out and find one to hire. When rock music came in, I found that half the guitar players I wanted could only read chord changes, not melody lines. Now that work has dwindled, I have a beautiful rehearsal orchestra with whom I play every Wednesday night in my office. I write symphonies reduced down to 10 players. I have musicians from the Philharmonic who play for me during their dinner break. I don’t play half as good as the people who I play second with. But I’m still a professional trumpet player, don’t get me wrong. All of my work over the years were union jobs under a Local 802 or AFM contract. Thank God for my pension and royalties. How should you break into music these days? If you’re talented, the first thing to do is hang out with other musicians. You become a success through others. I was not a jazz musician, but my friends were Al Cohn, Zoot Sims and Dizzy Gillespie. They gave me work. I love music. I wish I could play the trumpet better because I don’t approach the talent of all the musicians who play in my group. The French horn players – they play in the ballet! The trombone players – they’re all great. Except me! But wait a minute – it’s my office, I write all these beautiful arrangements, I serve drinks, we all have a wonderful time, so I’m here on a free pass, but that’s why I play second trumpet or else.